Represented M.C.C. Baseball Section from 1929-1945, MCC Baseball Section Coach 1940-1948, Victorian Baseball Team 1931-1940. He was a member of the MCC Baseball Section from 1929 to 1948 and was a key member of a side that was as strong as any in its history, he won 7 premierships and championships as a player and he was captain or coach of many of these from the late 1930’s until he retired to coach North Melbourne in 1948. 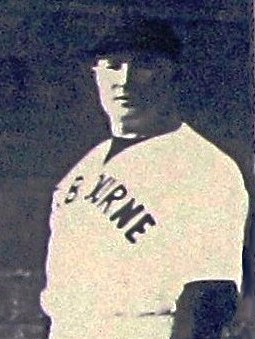 Starting his baseball career with the Williamstown Baseball Club in the late 1920’s, he moved over to the MCC in 1929, and his efforts were rewarded with State Selection in 1931. He was a regular member of the state side until 1940 and a state selector. In 1936, Stan Quinn received an award for catching 36 consecutive innings without error in the previous year’s Claxton Shield carnival. In 1937 Stan married Phyllis MacDonald in Yarraville. Stan also excelled at other sports, he was a 1st class cricketer as well representing the State of Victoria from 1931-1938 and a grade cricketer at North Melbourne from 1930 to 1944. He still holds the record score for the Victorian shield cricket 4th wicket partnership with Ian Lee of 424 in 1934 vs Tasmania, Stan scored 210.